So you go through all the sleepless nights whilst pregnant, cuddles with a newborn (more sleepless nights) and a complete change in life, body and soul. Your hormones shout at you from a corner of your mind saying "I want another" "it's time to get yourself back" "gosh aren't those kids cute" until you don't know which way to turn. What? who said those beautiful plump, smelling like snuggles and all giggly babies could grow up? So fast too, it's like I'm in a time warp except it's going extra fast and the days, hours and weeks are whooshing past my ears...unless they are ill (or I'm ill) then time stops and the minutes drag as you wait for the next wave of illness to hit. The once still and cute little meowing baby that only wanted to be held by you, all...day...and...all...night long, now screeches and wriggles to be set free to explore the world around them. His sister features as Cinderella and he had a go at eating the rug on the way past but hey just a normal Monday in our house! 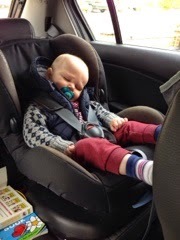 He also graduated to a forward facing, fixed car seat (which we also did a review of on the Youtube channel ages ago (shameless plugging right now I know!). He loved it and now just watches the world go by and more often than not falls asleep. 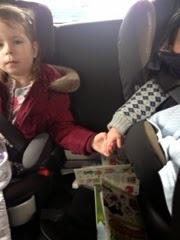 At one point the kids even held hands, I know, too cute but also a little unnerving as they never do things like that! No more crying or moaning as he can't see what everyone else is doing. I feel happier that he is happier but I'm not happy as it signals another set closer to growing up. I'm not sure how I let it happen that they are both getting older and loads of people keep saying "Oh wait until they are teenagers, then you'll feel old and worry loads" but I bet those same people had little spasms about their babies turning into little adults too - they just can't remember back that far. Shhhh don't tell anyone but a little part of me is secretly happy about it all because I'm starting to feel like me again, I don't have any time but I have a bit more inclination to do things for me and take time to actually put makeup on etc.